The ambitious result of a collaboration between Michelin-starred Hemant Mathur, chef and founder of the critically acclaimed Devi Restaurant and his wife, Executive Pastry Chef Surbhi Sahni, we were excited to see what Tulsi Restaurant had to offer. Located in the Midtown East section of Manhattan, this is one extremely beautiful restaurant. 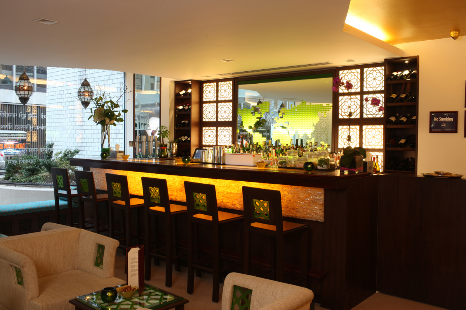 Tulsi, which translated means “holy basil”, is a top rate restaurant by any standard. With plenty of green hues and an extraordinary contemporary design scheme, this establishment smacks of quality and taste from the moment you enter. With an impeccable attention to detail including mother of pearl accents, ‘netted’ cabana areas to suggest privacy and gorgeous crystal chandeliers, you dream of returning to share this find with those close to you, before you ever reach your table. At only 55 seats this is an intimate and sophisticated environment with food and service to match. The Samosas, available in three varieties (spicy mozzarella & basil, potato & onion and lentil & green pea), took a traditional dish and finessed it with just enough of a twist to get us very excited for what was to come. Sitting by its side was the Shrimp and Crab Stuffed Pappadum (with coconut, green chile and onion) which was extraordinarily original and complex. Next up, was the very memorable Seared Scallops (with red pepper sauce and cumin-green pea quinoa). This tantalizing delight articulated the brilliance of Chef Mathur and made our taste buds stand up and salute. Everything was just right. You know that feeling? The service was impeccable, attentive without hovering, educated but not pontificating—a true delight. Next we ventured on to the Tandoori Prawns which was served with insanely delicious crispy okra and eggplant chutney. The fresh naan was a welcome addition and was enthusiastically enjoyed as cleanup for the remaining sauces dressing our plates. Seemingly, the bar kept being raised. Next up were more treats from the tandoor that were simply brilliant. 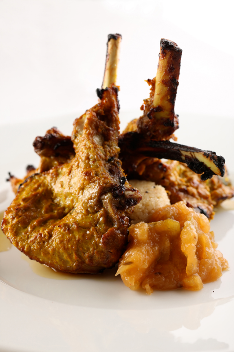 A plate that was jointly blessed with Hermant’s Tandoor-Grilled Lamb Chop and a Wild Boar Chop, served atop South Indian potatoes and apple chutney. This was quality at its best. The execution was immaculate, the taste… close your eyes. Although completely sated, we felt it imprudent to not at least taste the treats being offered by Chef Sahni. So with our game face on, we braved the storm and dove into the Ginger Panna Cotta (poached pears, spicy Campari sauce and candied orange zest) and the Eggless Pistachio Cake (served with kulfi and Gold leaf)—an elegant ending to a memorable meal. Seeing that this is still at a young stage and now boasting its own Michelin star, Daily Food and Wine is looking forward to checking in on Tulsi periodically, to see what else is being created by this magical duo.